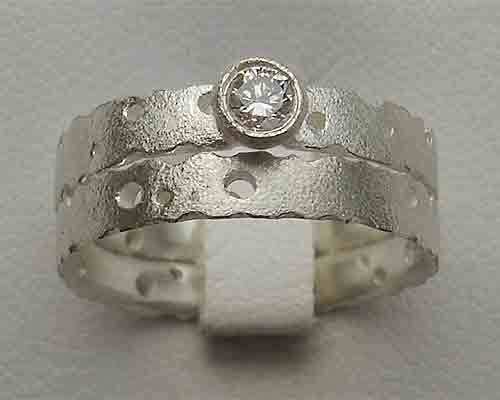 Designer Sterling Silver Bridal Set : LOVE2HAVE in the UK! These particular sterling silver rings make a stunning designer bridal set from our textured ring series, and we are finding that sterling silver bridal sets are indeed a trendy choice for women. 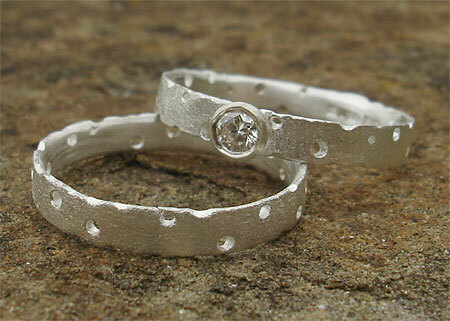 Here we have a sterling sterling silver diamond set textured engagement ring and matching plain sterling silver wedding ring with a unique designer appeal. The grainy textured surface of these rings is similar to that of the surface of sand or even dust. The subtly pitted texture looks like sand or dust sprinkled onto the silver. Both sides of these rings have random cut outs with wobbly edges, and finally, for that added designer touch, small random holes have been cut through for added dimension. The width of the engagement ring is approximately 3mm, with a single solitaire 3mm/0.10 carat brilliant cut white diamond. The plain wedding ring is about 4mm in width. The engagement and wedding ring are both available to purchase separately on our website, but by buying them together, you will be saving money. We may be able to offer you a further discount too for a third wedding ring, and we can provide this in wider widths also. Please email us for details. Precious stone(s) Available: 1 x 3mm/0.10 carat white diamond. Returns Policy: This UK made sterling silver bdidal set is made to order so, therefore, non-returnable unless faulty or not as described. Please see our terms and conditions.